Find ease. Maybe you’ve heard this before? Maybe you’ve wondered what it really means or looks like? Most of us are used to living in force mode: willing things to happen, or doing every single thing you can to achieve a specific outcome, no matter what. In this week’s episode, I am sharing a story that illustrates the difference between when you choose ease over force. You’ll want to listen to this episode if you have been struggling with a project or task and not making any progress. Ask yourself these questions to reflect on how force and ease show up in your life. Where in your life are you trying to make something happen? Where are you doing something out of scarcity or not enoughness? What would it look like for you to be certain that whatever it is you are trying to create, will emerge as it is supposed to? Or? Know someone who might benefit from this episode? 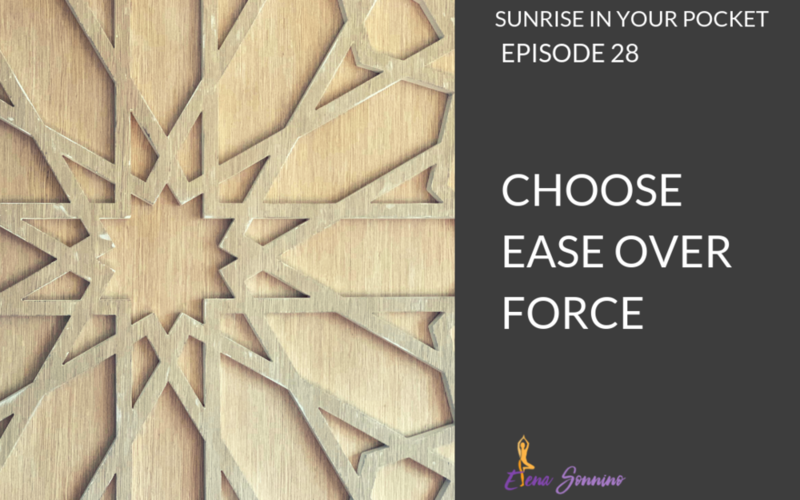 Share this episode with a friend who could use this nudge to explore how to choose ease instead of force.